Atlantic Center for the Arts’ very active and involved ‘league’ of volunteers consists of over 150 members that come from a variety of diverse backgrounds which contribute to a wide range of organizational and programming needs. These volunteers are the backbone of the organization providing ‘hands on’ assistance, financial support, and community awareness which is vital to our Mission. Members now provide over 10,000 hours annually which has increased substantially since its official founding in 1991. The ACA League’s main focus is to serve as the volunteer corps of ACA and is committed to furthering the growth of the arts in the community. They also actively support two major fundraising events, IMAGES: A Festival of the Arts and Horsin’ Around, provide assistance with Community Outreach projects, and run their own creative fundraisers throughout the year. 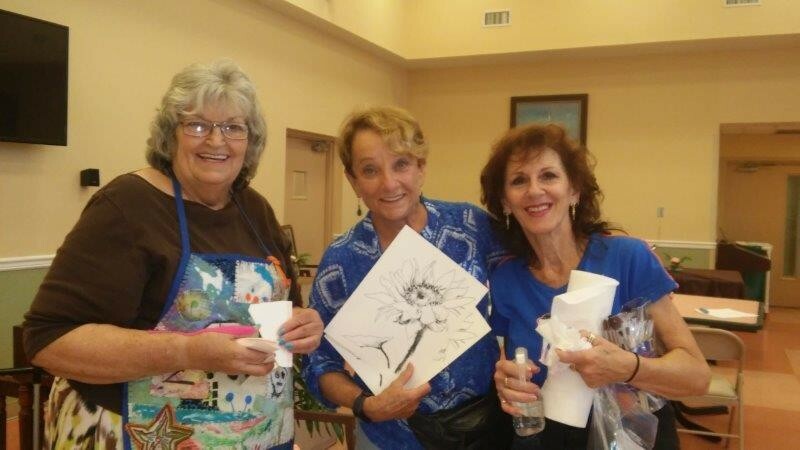 The purpose of the league is to serve as the volunteer corps of Atlantic Canter for the Arts, further the growth of arts in the New Smyrna Beach area, and foster community interest, appreciation and support of Atlantic Center for the Arts. To get involved, contact Peggy Imbert, Volunteer Liaison at pimbert@atlanticcenterforthearts.org or 386-402-7517. – Assisting with all events and related activities involving the ACA League, ACA, and IMAGES: A Festival of the Arts. – Travel to and from meetings and events, running errands, etc. – Time Spent on the telephone or computer including work done at home. – Special projects including office assistance or reception desk at Main Campus and Arts on Douglas. – Assisting in the Commons kitchen during Residencies. – Assisting artists/teachers during ACA’s Summer Art Camp, Middle School and High School programs. glassware, furniture, and many other items. Many hands are needed to assist with pricing, collecting, setting up and selling. Cookbook: A new fundraiser being introduced this year. Fashion Show: A popular event where local shops provide the latest fashions for League models. This is a special event includes lunch, raffles and shopping for members and the community. Arts and Crafts Team: A merry group of volunteers participate weekly to create original holiday ornaments and other special gifts. Items are sold at the Tour of Homes’ boutique near the holidays. Social Events and Member Recruitment: Volunteers experience meeting new people while enjoying a good party. This committee finds creative ways to introduce the community to all volunteer members. League membership dues are $25 per year (Included in any ACA Membership) and volunteers are required to contribute a minimum of 36 hours per year. Hours are recorded in the Volunteer Hours book at the ACA Main Campus or downtown location. Total hours are tallied in December and awards are presented annually in January or February to volunteers that have performed ‘above and beyond’ during the previous year. The ACA League offers unique experiences in Community Art Education & Outreach, rewarding interaction with the communities’ youth, fundraising opportunities, friendship…and FUN!